They have different names for each season, different shoes for all seasons, and different hats for winter and spring, or the summertime. 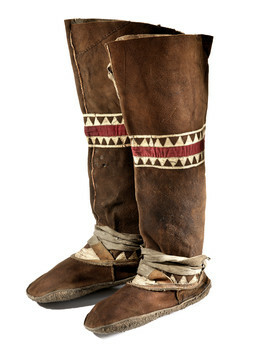 The dark brown leather of these Chukchi summer boots is probably tanned and dyed reindeer hide. The boots are trimmed with red cloth and with triangular mosaic designs of made of bleached and dyed skin, a woman’s style. The boots have leather tightening straps at the ankles and soles of bearded seal. Grass pads or socks were worn inside for cushioning and to wick away moisture. Aron Crowell: These are Chukchi boots . . . with 1971 as the year the museum got them. Are these familiar? Nicolai Etteyne: Yes, the designs, they have ugruk [bearded seal] on the bottom. I guess it’s seal on the top. That is also spring boots. You can see they come like this [top edges of soles]. Protects when snow melts, and it doesn’t go inside. Aron Crowell: So that ugruk skin is waterproof. Nicolai Etteyne: Yes, and it’s . . .
Nicolai Etteyne: Yes, thicker than seal skin. Ugruk is used for making the bottom on the boots. Aron Crowell: Do people along the coast in Chukotka still make a lot of skin clothing? Nicolai Etteyne: Right now I have three different clothes, and people still use the traditional. Chukotka is very cold and windy, and Russians that come try to use Native clothes when they go hunting or fishing. They use mukluks, parkas and pants, all because they better protect from cold and wind. Aron Crowell: I meant to ask you the Chukchi names for these things, if you know. Nicolai Etteyne: . . . They have different names for each season. Different shoes have different name. Different shoes for all seasons, and different hats for winter and spring, or the summertime. Aron Crowell: You said these boots were good for spring, because they’re waterproof. . . . Could you talk a little bit about how the women would sew the boots? The Chukchi women would make the boots mostly or would men? Nicolai Etteyne: Chukchi women make all Natives make boots. But women have very long [boots] for wintertime, they fit all along the legs. They have a strap, tie it on a belt. Chukchi clothes are made for traveling. It’s more comfortable, because they use pants in wintertime that boots go inside the pants, and the pants go up and inside, and they tie it. Easy to walk and easy to change boots or shoes, inside of shoes, socks. Really hard to change in wintertime. Aron Crowell: But people travel a lot now. Nicolai Etteyne: People travel a lot. They design clothes easier to take off or put on, reindeer clothes when you’re travelling. When you’re walking, if you get warm or wet, you take off outside parka. It’s frozen, you take stick here in picture [use a snow beater; see E046005], and you can put on again. Aron Crowell: You knock off the ice. Nicolai Etteyne: Yes, and you’re not wet again. You stay comfortable, you don’t stay wet.